With over 20 styles to choose from, the Gildan product catalogue has something for everyone. It is your ultimate source for style by style, detailed information across the extensive Gildan line. To order your FREE catalogue today, please click here. We have selected over 40 apparel choices that are best seller to help you save time and money. 79 colours for even more choice! Gildan Brands swatch card boasts its widest range yet as Gildan continues to offer a variety of hues to meet your changing colour needs. It is a great tool to make the best choice. Learn why Gildan is one of the leaders in Corporate Citizenship. 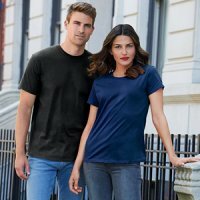 Gildan shows strong global commitment to employees, environment, communities, and of course products.